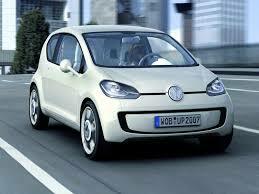 The Volkswagen Up is one of the newest additions to the list of small and economic city cars which are now so popular. If you want a vehicle which will get you around cheaply and without any fuss then is probably one which you are going to consider. The following are some of the points to bear in mind when deciding whether this is the car for you. Production of the VW Up started at the end of 2011. Because it is newer than many other cars in its class – like the Ford Fiesta and Vauxhall Corsa – there are far fewer models around. A few basic models have been around for a while, such as the High Up, Take Up, Up Black and Up White. There have also been recent signs that new models are going to be added to the list on an ongoing basis. One particularly interesting development is the arrival of an electric hybrid called the Blue e-motion. If you notice some similarities between the Up and the Seat Mii and the Skoda Citigo then there is a very good reason for this. All three of these superminis are made in the same factory and are basically the same vehicle with different badges and some relatively minor changes. When it comes to the most compact cars on the road the VW Up is regarded by many as being among the most attractive to look at. If you want a car which you can nip around the city in and feel proud of then this is a good bet. On a more practical level, this is an incredibly economic vehicle to drive. Apart from the low insurance grouping – which we will look at later – it is also a car which isn’t going to see you spend a lot of cash on fuel or taxes. The asking price for a Volkswagen Up is also pretty low even if it isn’t the cheapest in the market, with the manufacturer often bringing out special deals for customers looking to buy a new one. The fact that the Up has only been around for a limited period of time means that the used market isn’t as extensive as it is with some other cars, but this is something which should change naturally over time. More demanding drivers may be disappointed in the power of the Up but anyone else should be happy that it does pretty much what it promises to do. On a more positive note, it is unusual to see a car in this class offer an automated braking system like this one does. Size wise, it is clear that this is a compact vehicle, so you shouldn’t expect a huge amount of room inside it. Having said that, the design is clever enough that it doesn’t feel cramped once you are in it. Possibly the best piece of news for anyone considering buying a VW Up is that it offers just about the cheapest insurance around. This is because several of the models are classed as insurance group 1, which is the very lowest group of all. The Take up and the Move Up are the models which insurance companies generally class as group 1. In group 2 you should find the High Up, the Up White and the Up Black. A couple of models are a bit more expensive to insure, as the Rock Up and Groove Up are placed in group 4. When you are deciding which model to choose it is a good to get a full insurance quote on it, to let you see exactly how much you would need to pay on this if you were to buy it.